Cwn Annwn - the Hounds of Annwn - are a pack of red-eared, snow-white spectral hounds from the Celtic Otherworld. 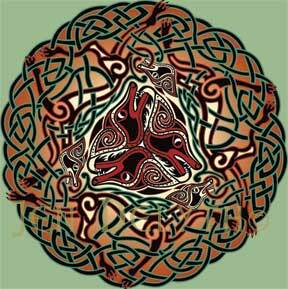 In Welsh folklore Arawn Lord of Annwn rides with his pack of hounds through the skies in autumn, winter, and early spring. Annwn is the Celtic Otherworld, the world behind the veil/mask. The Hounds of Annwn haunt the fringes of this world as the Wild Hunt and are feared to be the Hell Hounds whose baying is heard on the howling winds. In Wales, where they are also known as Cwn Mamau - Hounds of the Mothers, they were associated with migrating geese, whose strange call sounds like the Cwn Annwn of the night. Within mythology, such as the Welsh medieval tale the Mabinogi, they run with Gwyn ap Nudd - another Lord of the Otherworld - also appearing with Bran, or Arthur, and are the Hounds of Herne the Hunter.